Today was a great day. I have a lot of great days at Brooks, but this day was pretty epic. 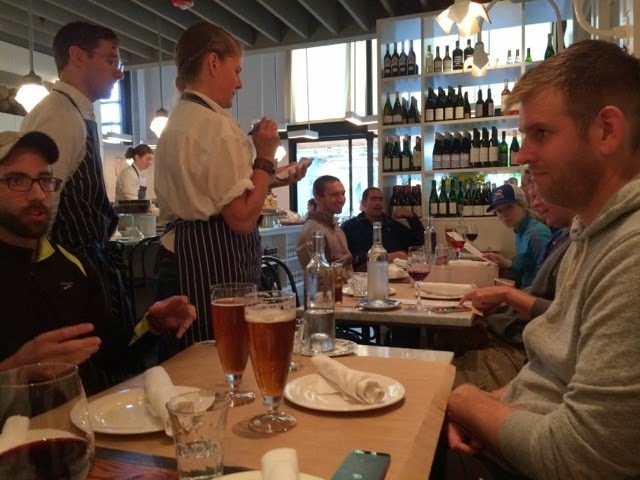 Every year our team does a summer outing and a holiday outing. 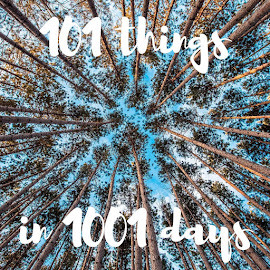 We've been glass blowing, kayaking, chocolate tasting, to baseball games, and, sure, to a couple of movies (some better loved than others). 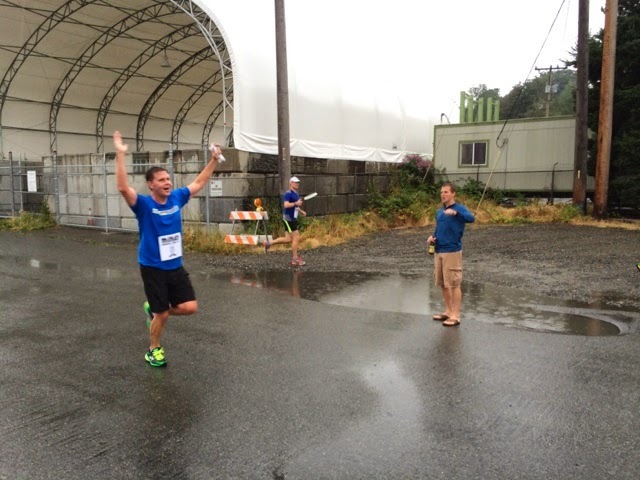 This summer we all voted and decided we'd like to do a team relay -- think Ragnar, but shorter. 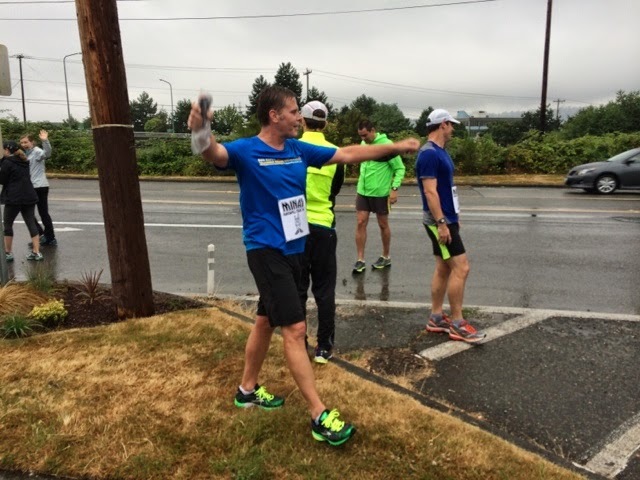 Ian surveyed the team -- how far would each of us like to run? 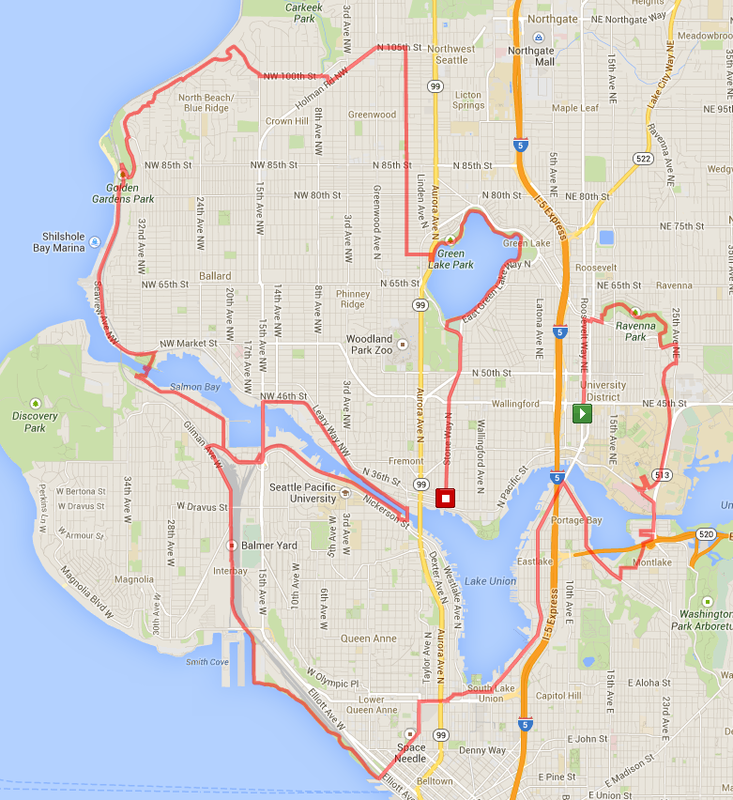 And put together an awesome route that went ALL OVER Seattle. Until we realized that a relay of that distance was going to take us 10+ hours to finish. And, well, that's just too long for a team-building outing! So Ian rejiggered the route, put us in pairs, and, voila, it's now a much more manageable 5 hours. You'll see that it's still pretty amazing, and a gorgeous route. 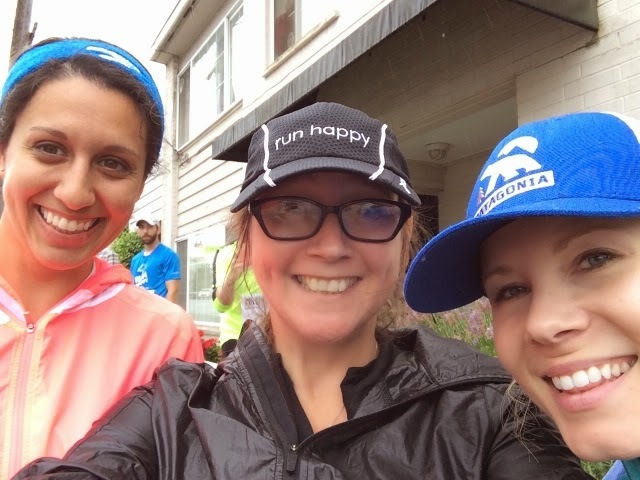 While the runners ran, the rest of us rode around in the van, cheering them on… and making sure we were at the transition zone on time to pile out and celebrate. Woot woot! 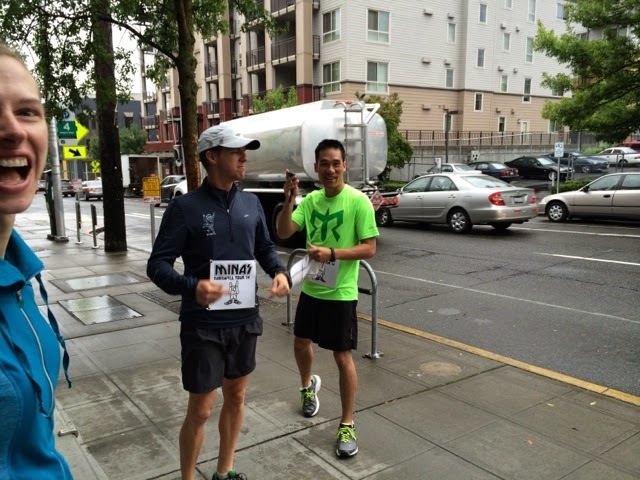 David and Ryan -- two of our speedsters -- started off the morning from the office. We went downstairs to cheer them off! 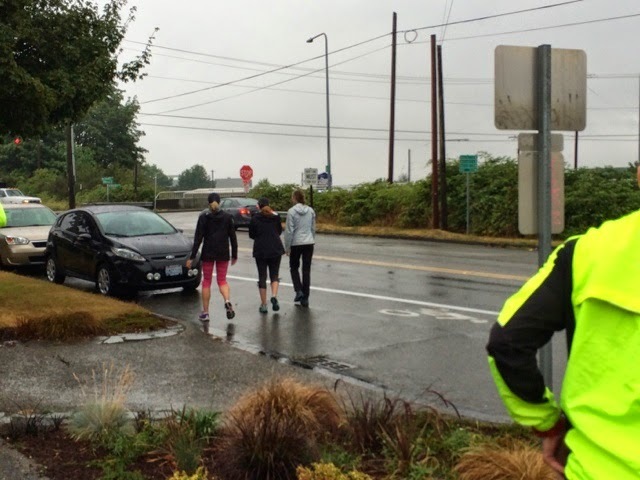 They were running a good long stretch up and around Ravenna Park, across the Montlake Bridge, back around to almost the University Bridge before cutting back along Eastlake and the Cheshiahud Loop to MOHAI. Once David and Ryan arrived, we sent off Barry and Marshall. 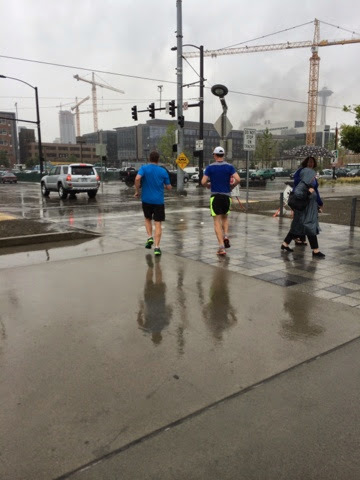 Let's just say that with all the weird construction… and a big fire… they may have found their own way down to the waterfront… where they joined the Elliot Bay Trail (one of my favorite spots to run!). Meanwhile, we piled back in the van and went back to the office to pick up Taylor, who had a final exam this morning (!!!!) and would be running later in the day. R & D freshened up, the rest of us made pit stops, and we headed over to Magnolia for the exchange. 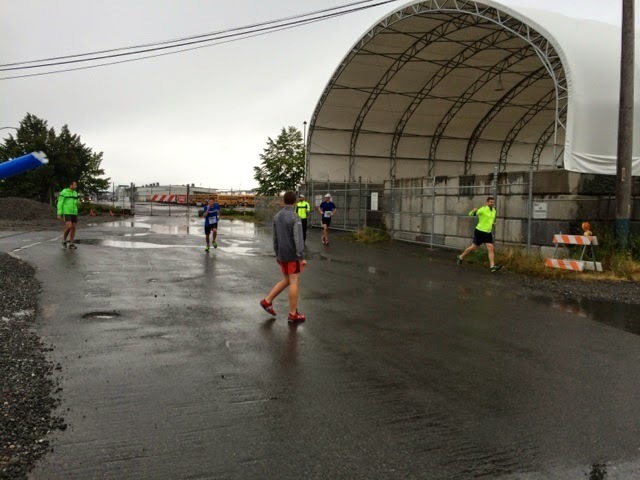 When we got there, we decided we should drive down to the railway switchyard so that we could cheer for them as they came out of the bike path… sad to see how disappointed Marshall was when we told him he had another wet, windy mile to run! 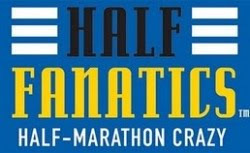 don't celebrate yet -- you've got a mile to go! 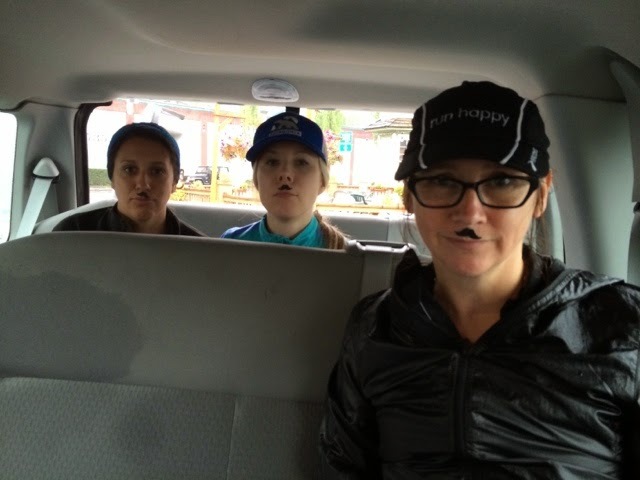 We got back in the van, cheering for them as we passed them running, and then went to the real transfer point. Meredith, Carrie, and Dre -- who was in a car accident last week and doing an amazing job of getting through the day! 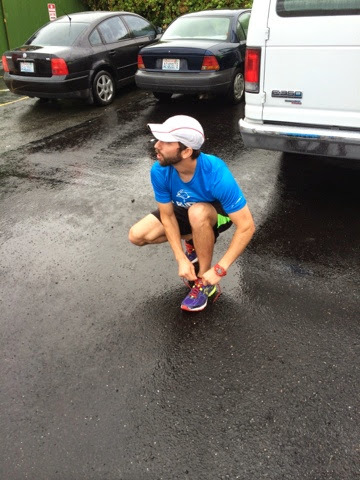 -- set off on their leg along the Ship Canal Trail. We drove to the Nickerson Street Saloon (the handoff point) to wait. Some of the guys went in to get changed and have a drink, while for some reason Nikki, Jenni, and I decided to have coffee from the coffee stand. (Chai! It was chai, darn it!!!) While we waited for our drinks, the skies just opened up. 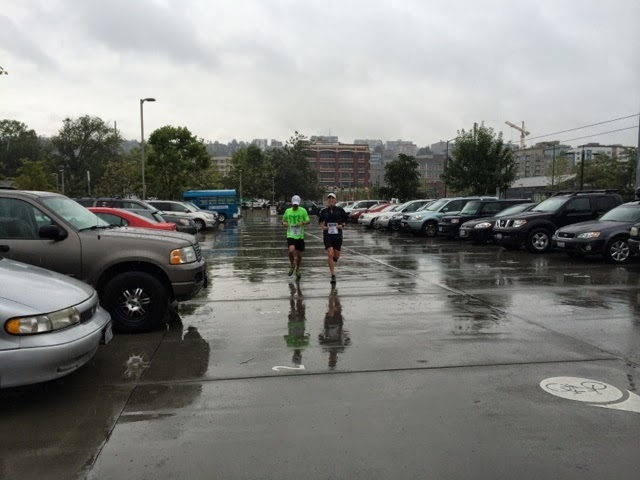 It had been raining off and on all day… but this was real drenching rain. We piled in the van as quickly as possible, drinking our chai. So. Very. Wet. Team Tiny Mustache drinks chai. Soaking wet. In the van. (These little mustaches were on our drink lids. Honest. 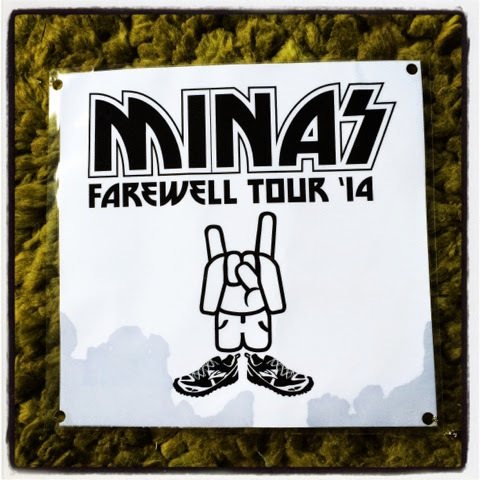 And then sent off Minas and Taylor. 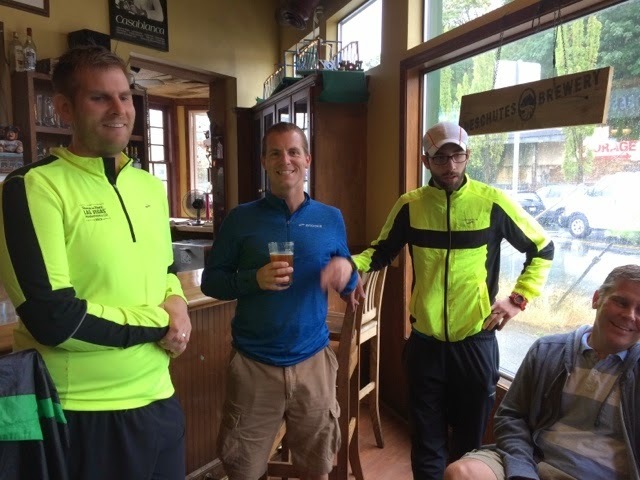 They had a great route along Leary to 46th, across the Ballard Bridge, back around to the Ballard Locks, across the locks, and along the Burke-Gilman trail to Paseo. The rest of us headed in to the Nickerson Street Saloon to dry off, relax a bit, and have a quick drink. Okay, okay, so we left it too long… but Minas and Taylor (speedsters themselves!) had already arrived. Oops. 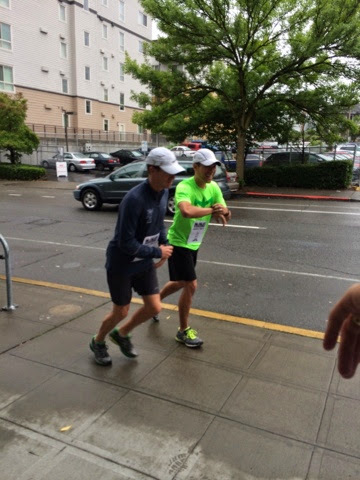 Ian and Jeff were up next -- they had a long, uphill route… the upside of which was that they got to run past Jeff's house, where his kids went outside to cheer for them. Awwww! 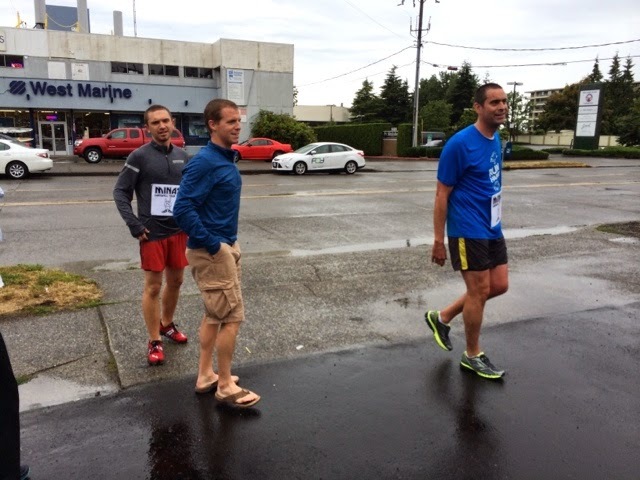 Jeff and Ian heading out… hey, isn't that Paseo??? Meanwhile, the guys and Meredith ordered food from Paseo and ate in the parking lot. 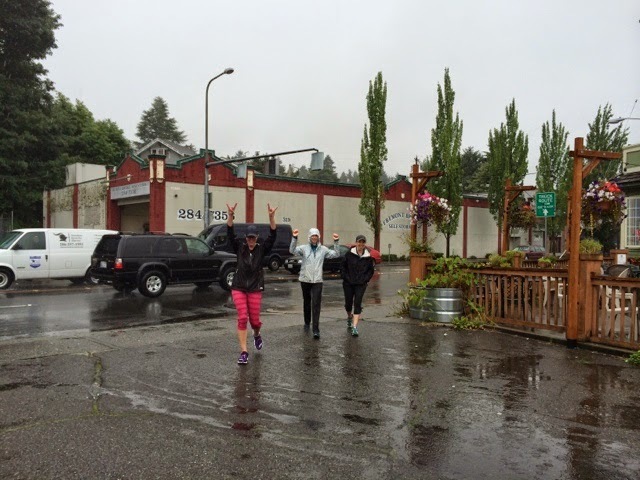 Nikki, Jenni, Carrie and I were hungry… but three of us were getting ready to run and Carrie was holding out for our post-run spot: The Whale Wins. Eventually, we got back in the van and drove over to the PCC by Green Lake -- another pit stop -- and waiting for Jeff and Ian to arrive. It had actually stopped raining when they set out (how does Ian set that sort of thing up???) but started again when it was our turn. The three of us stepped out of the van… no ceremony, no cheering. Heck, folks were tired and it was raining! 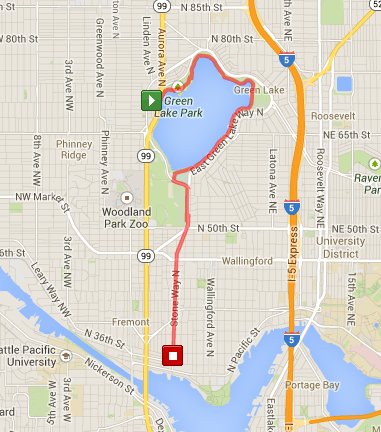 We ran to the corner, spent several minutes waiting to cross busy Aurora Avenue, and then headed down to Green Lake. 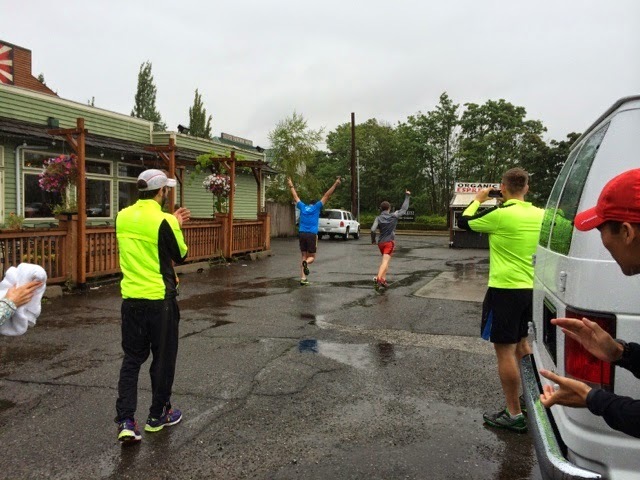 Yep, that's right -- we ran the final leg. Probably wanted some Super Fast Folks to run the anchor leg, you know, so we could make up some time. Ha ha ha. 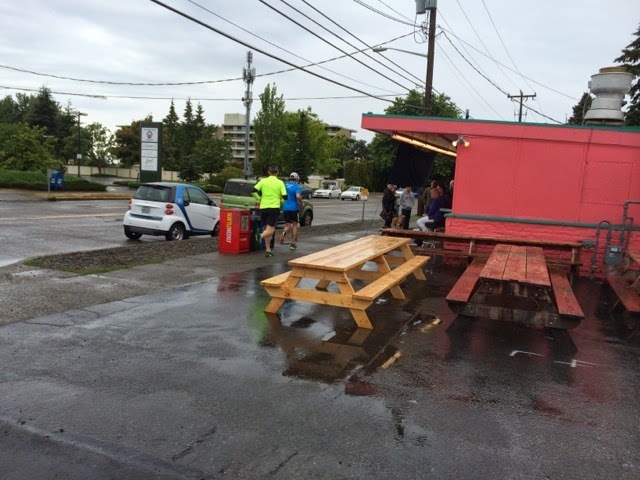 Not much to report, other than rain, rain, rain, crosswalk (which always makes me hear elevator music in my head), rain, rain, rain, then the restaurant. We headed inside, pretty wet, and the three of us went straight to the bathroom to dry off with some paper towels. We then proceeded to eat EVERYTHING IN THE WORLD … at least, one of nearly everything on the menu … for a very, very delicious lunch. So, the weather could have been nicer, but other than that it was a perfect day. Have I mentioned I love working for Brooks?